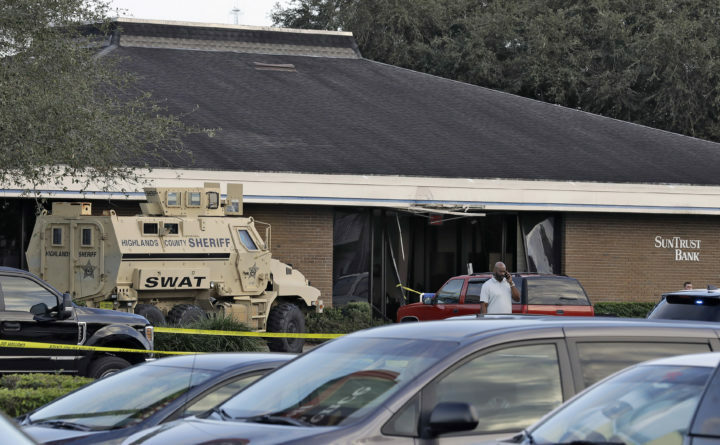 A Highlands County Sheriff's SWAT vehicle is stationed out in front of a SunTrust Bank branch, Wednesday, Jan. 23, 2019, in Sebring, Fla., where authorities say five people were shot and killed. At least five people are dead after a gunman opened fire Wednesday afternoon at a SunTrust Bank in Sebring, Florida, authorities said. At about 12:30 p.m., a man contacted police to say he had fired shots inside the bank, according to the Highlands County Sheriff’s Office. When authorities arrived, they established a perimeter and attempted to negotiate with the gunman, the sheriff’s office said. The suspect eventually surrendered, they added. “After an assessment of the scene, we were sorry to learn that we have at least five victims, people who were senselessly murdered as a result of his act in this bank,” Sebring police chief Karl Hoglund said at a news conference. The suspect was identified as 21-year-old Zephen Xaver of Sebring, authorities said. At the news conference Wednesday afternoon, Hoglund said the victims’ families had not yet been notified. He and other officials did not take questions or elaborate on whether there was a motive in the shooting. “Obviously, this is an individual who needs to face very swift and exacting justice,” Gov. Ron DeSantis, R, told reporters. Footage from the scene by WFLA News Channel 8 showed several police cars surrounding the bank, where the entrance was mangled and shattered. “ONLY co-workers and family members please,” the sheriff’s office said.